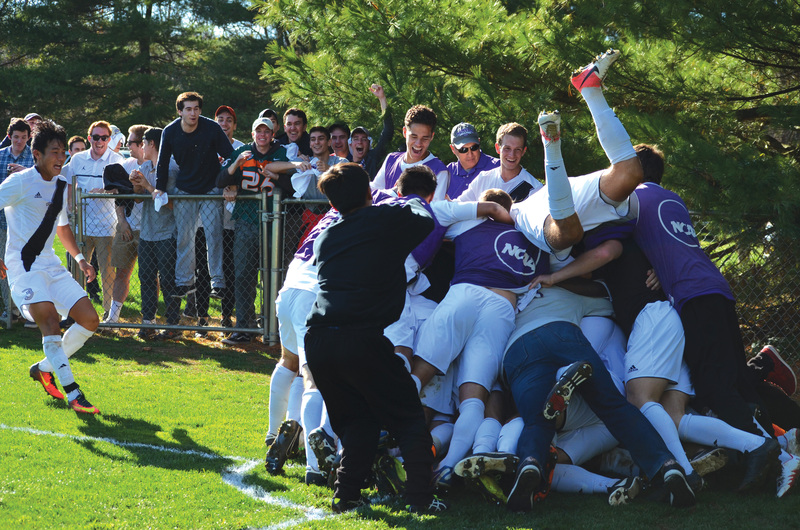 This Saturday, in a double overtime win against a stout Oberlin College team, the Lords soccer team clinched its third straight North Coast Athletic Conference (NCAC) tournament trophy and an automatic berth into the NCAA tournament. Three minutes into the second overtime period Saturday, Kenyon (17-2; NCAC 8-1) and Oberlin (15-4-1; NCAC 7-2) had been locked at one goal apiece since minute 29. Senior keeper Sam Clougher launched a ball over the Oberlin defense to the sprinting Philippe Stengel ’20. Stengel surged past a defender and volleyed the ball from the top of the 18-yard box, past the outstretched hands of the Oberlin keeper and into the lower-left corner of the goal to seal the Kenyon win. The game began poorly for the Lords, who gave up a goal to the Oberlin Yeomen in the first four minutes of the match. An Oberlin cross arrived in the middle of the Kenyon box, and Yeoman forward Sam Weiss put it past Clougher on the near post. 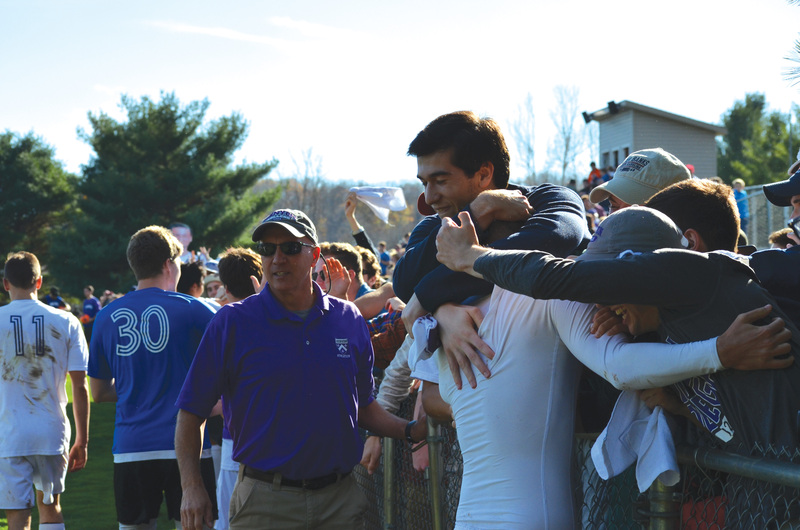 This was the second straight week in which the Lords found themselves down in the first 10 minutes of the match, a trend that will have to stop if Kenyon hopes to advance deep into the NCAA tournament. The Lords remained in a deficit until Billy O’Neill ’18 scored in the 30th minute of the match. O’Neill lofted the ball into the Yeomen goal, perfectly placed to fit just over the Oberlin keeper’s hands and just under the crossbar, knotting the game at 1-1. “It was meant to be a cross,” Dalton Eudy ’17 said. In the second half, Kenyon applied crushing offensive pressure, firing off shot after shot to beat the Oberlin keeper. The Oberlin goalie was up to the challenge, saving every attempt that the Lords had on net — some in incredible fashion. On the other side of the ball, the Yeomen were able to muster up some chances, but were denied by the Lords defense, anchored by Clougher. After 90 minutes could not separate the two sides, Oberlin and Kenyon went into overtime for the second time this year. In the first overtime period, the Yeomen had their only chance at a goal and came up empty-handed. Shortly after, Stengel took the title-clinching shot. This Saturday, the Lords head down to Lynchburg, Va. to face Maryville College (18-2; Maryville, Tenn.). A victory against Maryville will have the Lords face either Lynchburg College (16-1-4; Lynchburg, Va.) or John Carroll University (12-5-3; University Heights, Ohio) on Sunday.